Garcia Orthodontics because this is National Orthodontic Health Month. 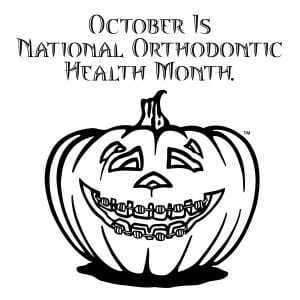 During October, orthodontic offices all over the country work together to promote their services and inform the community about the important work we do. Our goal is to draw attention to the fact that everyone needs to be evaluated for orthodontic treatment. You are never too young or too old if your bite or smile needs correction. Filed under Blog by Dr. Francisco Garcia on Oct 1st, 2018 . Comment. We use our smartphones for almost everything in our lives. From setting alarms to wake up, to tracking our workouts, calories and calendars, we keep our phones close to us at all times. That being said, it comes as no surprise that our phones can be used to help improve our oral hygiene as well. To help establish or improve your daily routine during orthodontic treatment, Garcia Orthodontics is sharing a few apps here are a few apps you can try. Filed under Blog by Dr. Francisco Garcia on Sep 18th, 2018 . Comment. Bummed out that summer is almost over? At Garcia Orthodontics in Miami, FL we feel this is a great time of year to revisit the basics of caring for your teeth during orthodontic treatment. Starting a healthy routine at the beginning of the school year will go a long way towards achieving a beautiful, healthy smile. When done right, good oral care maintenance could lead you all the way to next summer and beyond. Filed under Blog by Dr. Francisco Garcia on Sep 5th, 2018 . Comment. Should You Use An Electric Or Manual Toothbrush While You Have Braces? You’re just starting orthodontic treatment and it’s time to brush your teeth. Do you brush with a manual or electric toothbrush? The truth is that either type of toothbrush does an effective job of cleaning the teeth. For those of you not convinced, we’ve listed some features and benefits of each so you can decide for yourself. It’s simple, affordable and easy to find. Changing your brush every 3 months doesn’t hurt your pockets. Depending on the type of brush and your brushing method, manual toothbrushes could be softer on the tooth enamel and gums. Filed under Blog by Dr. Francisco Garcia on Aug 16th, 2018 . Comment.